The Mayor of Willoughby and Patron of the WDHS, Pat Reilly (front right) with museum supporters at the official opening of the ‘Growing Up in Willoughby’ exhibition on 3 November 2005. The Willoughby District Historical Society (WDHS) was established in February 1974 with the objective of: “Encouraging the study and appreciation of the history of the Municipality of Willoughby in particular and of Australia in general.” It was incorporated as a not-for-profit association in September 1989. As the organisation has evolved, its objective and activities have become focused on the history of the Municipality of Willoughby (now Willoughby City). The WDHS has operated the Willoughby Museum in Johnson Street, Chatswood, since 1993. Regular general meetings feature speakers on historical subjects relating to the history of Willoughby, workshops and interactive features on historical themes. Our newsletter, Willoughby History Chatters, is published six times a year and is distributed electronically (full colour) or by mail as a hard copy (b&w only). It provides news of WDHS activities, short articles on local historical topics and details of forthcoming events and tours. It is sent to all members, exchanged with the newsletters of other historical groups in our region and is distributed to Willoughby City Councillors and staff and local groups with similar interests. 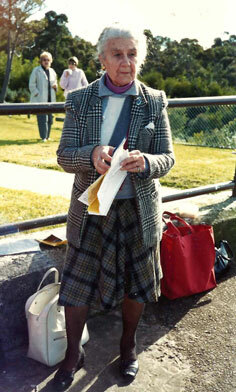 Tour notes in hand, Eileen Vaughan demonstrates her tour organising ability at a WDHS outing to Kiama in 1989. The Willoughby District Historical Society (WDHS) was established in 1974 with the objective of ‘encouraging the study and appreciation of the history of Willoughby’. David Warner, the Mayor of Willoughby, called a public meeting in the town hall on 13 February 1974 to gauge public interest in forming a historical society to ‘foster an interest in the history of the Municipality of Willoughby’. Some 200 people attended the meeting and many signed up to join the WDHS, which held its first general meeting on 14 March 1974 with John Vaughan as its inaugural President. By 1981 the society commenced a search for a suitable location to establish a local history museum. The search for premises ended when a letter arrived from a solicitor in October 1988 advising that a Federation-style cottage, Boronia, at 58 Johnson Street, Chatswood, had been left to the Society by a member, the late Sonya N Kirkham. The house had been built in 1913 for rental. On the recommendation of the Society’s solicitor, measures were undertaken to incorporate the WDHS and it was formally incorporated as a not-for-profit association on 27 September 1989. Following the massive task of cleaning up the premises and installing displays, the Willoughby Museum was formally opened by the Member for Willoughby, Peter Collins MLA on 30 October 1993. The “Australiana in the Applied Arts” exhibition, curated by Doug Zihrul, opened for the National Trust Heritage Festival in 2009. 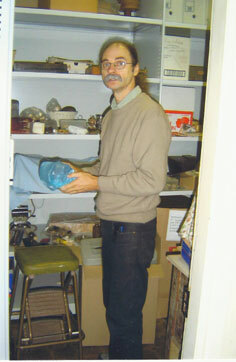 Volunteer Doug Zihrul, who curated our museum exhibitions between 2005 and 2009, sorting collection objects in the store room in 2007. During 2009 members of the WDHS Management Committee participated in the Museums & Galleries (M&G) NSW Standards Program and, following this, we developed a strategic plan and a comprehensive collection policy during 2010. The collection policy sets out four core themes that define the activities of the museum and the fields in which its collection will be focused. Click here for the WDHS Collection Policy. Since 1974 a large number of people have contributed their time and expertise to the development and operations of the Society. Please click here for full list of present and past Office Bearers.